Force-on-force exercises can iron out dangerous reactions. Nothing can prepare you for the real thing, but force-on-force training comes as close as possible. Force-on-force training is the next-best training to the best--but worst--training: real-world encounters. Make a mistake in force-on-force training, and all that suffers is your ego and perhaps various stinging body parts. In real life, you don't get a "do over." Force-on-force training isn't new. Our military and lawmen have, for years, used various systems ranging from paper wad or wax-loaded rounds, through lasers to the FX system of primer-launched marking rounds fired using real guns converted to function with them. The FX system is great, but unless you are in the military or law enforcement, you, with few exceptions, can't buy it. After FX, the two best systems for force-on-force training are paintball and airsoft. They're not restricted like FX and are generally legal for purchase by those 18 years of age or older, except where local restrictions apply. Both use a round, non-metallic ball or BB in guns specifically made for the .68 caliber (paintball) or 6mm (airsoft) projectile. Both systems are effective in teaching many of the principles of defensive tactics. My personal preference is airsoft. Airsoft guns, in contrast to paintball guns, are made to be close copies of authentic handguns, rifles and shotguns. 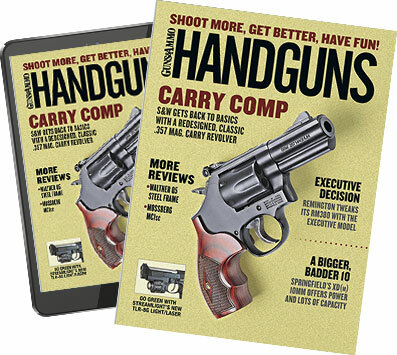 For specifics on training with airsoft, check out James Tarr's article in the April/May issue of Handguns. The advantages of force-on-force training cannot be overstated, for with it you can learn to interact with firearms and live, thinking threats who will act and react in a manner not achievable by any other means. The results of such encounters are quite illuminating. Many times, upon first exposure to force-on-force, a student will freeze in place and do nothing--no taking cover or firing back--nothing. One student, when confronted by three armed threats, drew his handgun to low ready and fired all six rounds--into the ground. On numerous occasions, while the student presented his handgun, he would not aim it, let alone fire it, at the threat unless told to do so by the instructor. I've also witnessed real-world examples of such confusion on the part of lawmen on their first exposure to a real threat; certainly putting the lie to the oft-expressed "I'll be able to do it when I have to." For the most part, force-on-force training with airsoft is steered in two directions: exercises to learn or enforce specific skills or real-life scenarios designed to replicate actual possible situations. One example of a skill drill, and one of my favorite exercises with airsoft guns, is to stage a convenience store robbery. A participant walks into the scene and sees the store clerk being held at gunpoint as a "robber" demands money. The participant draws his gun and orders the assailant to drop his gun, only to find himself shot after the bad guy turns and shoots him before he can even get a single shot off. This drill is a real eye-opener, as most people do not realize that the bad guy can turn and shoot faster than they can pull the trigger until they run through the drill. The force-on-force scenario teaches them never to challenge someone with a drawn gun and that the best course of action may be to simply back out the door. It's a life-saving lesson. A great use of airsoft technology is to run home, car or office defense scenarios right in your home, car or office. Since the damage done by the plastic projectile is minimal, you can train anywhere. In closing, I must point out that while paintball and now airsoft are regularly used as toys in games such as "capture the flag" with opposing teams, the possibility of serious injury or death is always present if stringent safety precautions are not established and observed--particularly when those participating often carry and own real guns. This level of self-defense training cannot be done on the fly. I recommend Training at the Speed of Life, Volume 1 by Kenneth R. Murray (Armiger Publications, armiger.net, 407-532-7381) as a bible for force-on-force training and procedures for doing so. Ken is one of the pioneers of force-on-force work, having co-founded Simunition, Inc., which markets FX cartridges and firearms conversion kits for them. Force-on-force training may be "next best," but it is not a game.